New Chemistry research: Black phosphorus could help engineers surmount one of the big challenges for future electronics: designing energy-efficient transistors. This is a schematic of the "puckered honeycomb" crystal structure of black phosphorus. 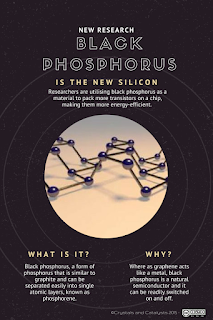 Published in the journal: Nature Communications, the researchers are utilising black phosphorus as a material to pack more transistors on a chip, making them more energy-efficient. The work is a result of a multidisciplinary collaboration among Szkopek's nanoelectronics research group, the nanoscience lab of McGill Physics Prof. Guillaume Gervais, and the nanostructures research group of Prof. Richard Martel in Université de Montréal's Department of Chemistry. Reporting on their finds, the scientists at McGill University, have found that when electrons move in a phosphorus transistor, they do so only in two dimensions. This will help in designing new energy-efficient transistors. "Transistors work more efficiently when they are thin, with electrons moving in only two dimensions," says Thomas Szkopek, an associate professor in McGill's Department of Electrical and Computer Engineering and senior author of the new study. "Nothing gets thinner than a single layer of atoms." Eleven years ago, physicists at the University of Manchester in the U.K. first isolated and explored the remarkable properties of graphene (a one-atom-thick layer of carbon). After their great discovery, the scientists were keen to to investigate a range of other two-dimensional materials. One of the new materials used is black phosphorus, a form of phosphorus that is similar to graphite and can be separated easily into single atomic layers, known as phosphorene. 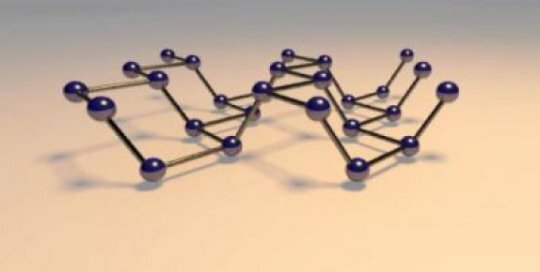 Phosphorene is now a growing subject of interest because it overcomes many of the problems of using graphene in electronics. Where as graphene acts like a metal, black phosphorus is a natural semiconductor and it can be readily switched on and off. "To lower the operating voltage of transistors, and thereby reduce the heat they generate, we have to get closer and closer to designing the transistor at the atomic level," Szkopek says. "The toolbox of the future for transistor designers will require a variety of atomic-layered materials: an ideal semiconductor, an ideal metal, and an ideal dielectric. All three components must be optimized for a well designed transistor. Black phosphorus fills the semiconducting-material role." To understand the way the electrons in a phosphrorus transistor move, the researchers looked at the electrons under the under the influence of a magnetic field in experiments performed at the National High Magnetic Field Laboratory in Tallahassee, FL, which is the largest and highest-powered magnet laboratory in the entire world. This research "provides important insights into the fundamental physics that dictate the behavior of black phosphorus," says Tim Murphy, DC Field Facility Director at the Florida facility. "What's surprising in these results is that the electrons are able to be pulled into a sheet of charge which is two-dimensional, even though they occupy a volume that is several atomic layers in thickness," Szkopek says. That finding is significant because it could potentially facilitate manufacturing the material -- though at this point "no one knows how to manufacture this material on a large scale." "There is a great emerging interest around the world in black phosphorus," Szkopek says. "We are still a long way from seeing atomic layer transistors in a commercial product, but we have now moved one step closer."